Earlier this week, our Layzell Dreger & Associates team hosted an art gala at our penthouse unit at LEGASEA. It was fascinating to watch the emotional responses that guests had to specific pieces of art - whether it reminded them of a childhood memory or a more abstract concept. I thought that it might be interesting to reflect on how art and real estate have evolved from the earliest years of the caveman. Prehistoric art represents how the earliest people viewed the world. Because of this, many of the paintings found in caves showcase animals and their hunting techniques that allowed them to survive. During this time, cave and rock art were done by respected elders or shaman and included religious and fertility references that help historians understand the lifestyles of the Stone Age people. Later, during the Mesopotamian era, art focused on warfare and writing was invented, as well as the introduction of monotheism. One of the most fascinating times for art and housing arises during the Egyptian times, in which art focused on the afterlife, family, and customs. Interestingly, art during this period was not intended to be seen, but rather to benefit a divine or deceased recipient. Most of the work that is showcased in museums today was produced for royalty and represent our modern concept of beauty, while many of the other pieces designed for lower class citizens are less proportionate and considered to be less aesthetically appealing. Symmetry, proportion and geometry were critical elements of both Renaissance homes and art. Inspired by classic Roman and Greek design, this period saw the emergence of columns, domes, and "harmonious forms". Architects studied classical buildings and ruins and architects transitioned from being viewed as skilled laborers to artists. Art and architecture focused on human scale and seemed to balance both emotion and reason. Many artists such as Michelangelo and Leonardo da Vinci worked in a multitude of mediums and studied anatomy, religion that continue to influence our world today. Today, our homes and art are often intertwined. As Jim Rohm states, "Whatever good things we build end up building us". Today, we have an immense amount of technology at our disposal to simplify our lives. As a result, homes and art have evolved to become an interactive experience that combines traditional art in a multitude of mediums and digital art that stimulates us. Art allows us to reflect on the effort, time and story that was undertaken by the artist. Art encourages us to view the world we live in differently. How many times has a friend, family member or co-worker mentioned that they had attended a paint night or pottery class in pursuit of creating a piece of art that inspires them? At our art gala, it was so interesting to see the variety of influences that inspired the incredible Vancouver Island artists. 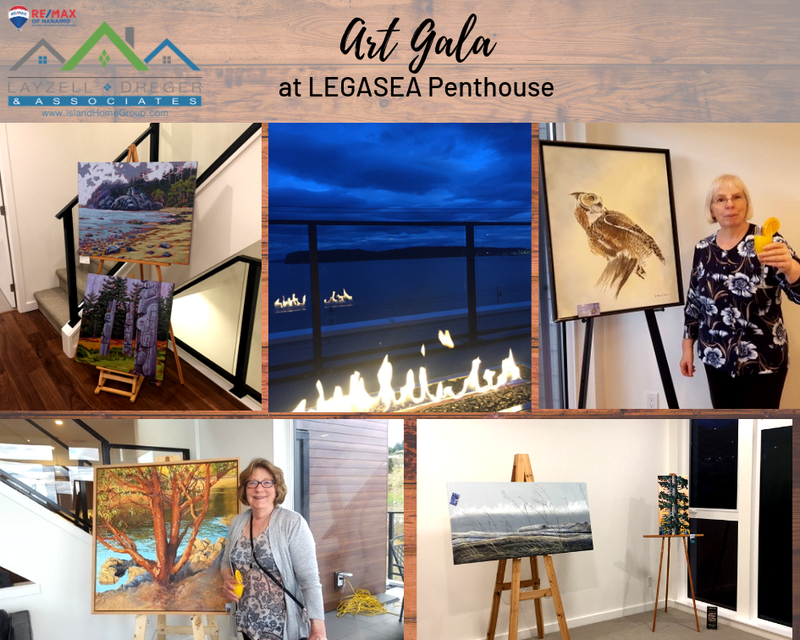 It was an exciting event to host in one of Nanaimo's most unique penthouse units that features awe-inspiring views of the ocean, beach, islands and mountain ranges. It truly combined the very best of art and architecture in one location. We are so grateful for the artists and guests who supported this incredible evening. Here is just a snapshot of some of the incredible art created by Island artists at our event.